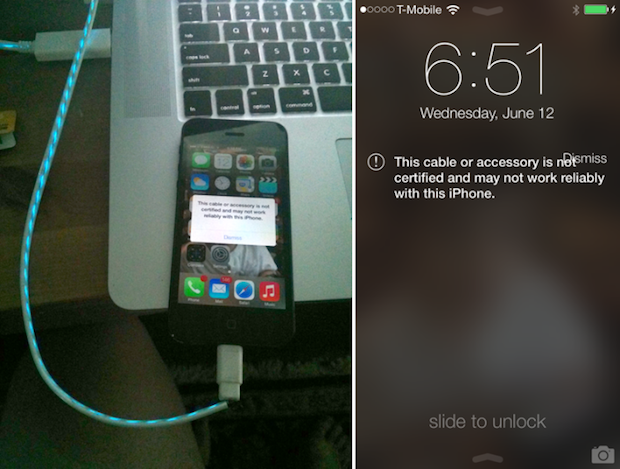 iOS 7 recognizes if you have an unofficial Lightning cable connected (via 9to5Mac). At first glance, it appears Apple has taken another step to strengthen its grip on the (Lightning) accessory market as it encourages users to purchase a certified accessory. After connecting the iPhone, you get a message saying, “This cable accessory is not certified and may not work reliably with this iPhone.” You don’t have to unplug it though; non-certified cables do work properly. You may recall that with the launch of the iPhone 5, Apple eliminated the classic 30-pin adapter and introduced the 80% smaller Lightning connector. 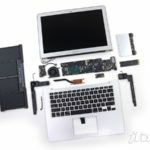 Its teardown revealed that there are four chips embedded within that in some part provide security to prevent if from being copied by third-party manufacturers. There was a particular TI chip that was assumed to be the source of the security of the Lightning cable. Third-party certified Lightning cables arrived in the Apple Store late last year, as Apple maintained strict controls over partners within its Made for iPhone (MFi) program. A separate report published by the New York Times citing a certified Lightning cable manufacturer, Mophie, said that with the new security feature, Apple could disable un-certified Lightning cables. This, however, doesn’t mean you need to order an Apple-certified Lightning cable right now, but it does show that the company will take firm steps to stop the sale of counterfeit accessories in the future.